Panasonic's new HDC-SDT750 ($1,400) camcorder offers a detachable 3D lens—making it easy to shoot 3D when you want, and 2D when you don't. Panasonic's HDC-SDT750 has excellent 2D features: 3 full HD sensors, a Leica 12x zoom f 1.5- 41.4mm Dicomar lens and 3” touchscreen LCD. Other features include time-lapse recording, Full HD 60p recording for clearer fast motion shooting, 5.1 channel audio, 14.2 MP stills, facial and smile recognition, auto-focus and auto exposure tracking, optical image stabilization and a host of other goodies. Alas, when you put on the supplied 3D lens converter, you lose most of these features including the ability to zoom, auto-focus and auto exposure tracking, still picture recording, and face recognition, among others. That may seem like you're giving up a lot, but what you are left with is pretty impressive on its own merits. You get a fixed-focal-length 3D camera that is easy to use and makes really good 3D. You won’t get jump off the screen 3D like the pros, but the 3D is immersive enough to make you feel like you are there. It’s natural, well suited for regular people to record life’s big and small moments. The camera is very lightweight and fits in your hand easily. The 3D lens does make it a little longer than a typical camcorder, but it doesn’t cause any issues for shooting. I do wish that the zoom would work, but that is one of the sacrifices to get 3D, for now. The snap out viewfinder is a little small for my liking and the image quality of the LCD is very poor. There are a set of initial adjustments that must be made when you start the camera to ensure the 3D lens is mounted properly. Fortunately there is an easy-to-follow step-by-step on-screen guide that takes you through the quick process. After that is done, it’s just point and shoot. The stated minimum shooting distance is 1.2 meters, or approximately 4 feet. I was able to get closer and still keep focus and get acceptable 3D. The video below doesn’t really do justice to the 3D this camcorder is capable of, but it will give you a taste. You’ll need is a pair of 3D glasses to get the 3D effect (choose the 3D setting that matches the type of glasses you are using). It was edited with Roxio Creator 2011 ($75 ), which has the unique ability to edit 3D videos and burn them to DVD, Blu-ray or output them to upload to YouTube Facebook or anywhere else that you want to post your videos online. 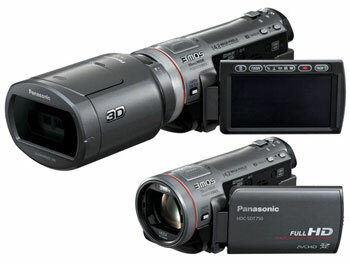 Overall, the Panasonic HDC-SDT750 is a fantastic 2D camcorder that produces very pleasant, easy-on-the-eyes 3D video. At $1,400, the HDC-SDT750 isn't cheap, but it is a real value. For the full review, go to HDGuru3D.com. Al Caudullo, the 3DGuy, is a freelance journalist, 3D Evangelist & Stereographer. A broadcast and display specialist for 30 years, Al has devoted the last three years to 3D education and 3D content creation. The 3DGuy teaches 3D at Mahidol University and offers 3D Workshops to corporations and individuals. His clients include Panasonic and Hitachi.